For those looking for answers to tonight’s game against Arkansas State, well there simply may not be any at all. This flat out may have been the worst performance against a non-conference team in Hoyas history, or at least in the JTIII era, so much so that fans were chanting “FIRE THOMPSON” in the final minute of the game. Arkansas State simply came onto the Georgetown Campus and dominated from the onset. They just didn’t let up and the Hoyas couldn’t find any answers to the start of the Maui Invitational presented by Maui Jim. Here is something that just stands out too much not to notice in this game. Georgetown trailed Arkansas State by 23 points. Yes, that is right 23 and in fact the Hoyas didn’t even really keep this game interesting until the final 1:30, when they finally cut the the game to under double digits with a press that Arkansas State could not handle. 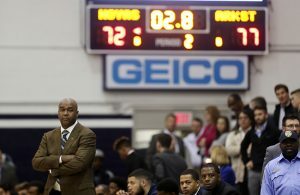 Another big mention about this game is that perhaps the Hoyas need to stop playing games at McDonough. Yes, it holds just 2,500 people, which they failed to fill last night, but it is also where they suffer losses to teams they really should not. Lets go back to 2009, they lost to Old Dominion that year in the regular season, and lets not forget about last years season opener, a loss to Radford. Perhaps its not just playing on campus, since the Radford game wasn’t. but its a good enough excuse right? We will just go with that and give them some hope.. perhaps. Are we the only ones that see some sort of pattern here of why Georgetown is losing its faithful and no wonder why the students are chanting to end the Thompson era at Georgetown? You just lost to a team that was predicted to finish 10th in the Sun Belt Conference. Since going to the Final Four in 2007, Georgetown has 10 losses against traditional mid- or low-major teams: Davidson in 2008; Old Dominion in 2009; Ohio in 2010; VCU in 2011; Florida Gulf Coast and Northeastern in 2013; Radford, Monmouth and UNC-Asheville in 2015; and now Arkansas State. The Hoyas now hit the road for a little sunshine in Maui, but their time to shine bright comes in the form of 4th ranked Oregon on Monday the 21st. This is a long way to go in a tournament that has some of the top teams in the country, UNC, Wisconsin and yea, should have been Georgetown. Now they will have to knock of a Ducks team to right the ship before it totally sinks if they hope to reappear in the rankings this season.